After a lengthy round of votes, Hugh Forsythe was selected tonight to serve on the Leesburg Town Council dais for most of 2017. Forsythe was one of five finalists to fill the council seat—formerly held by Kelly Burk, who took over as mayor Jan. 1—until a special election is held in November. Jed Babbin, Gwen Pangle, Joshua Thiel, and Rusty Foster also were on the list. Each candidate was asked to answer three questions in a presentation to the council that began Monday’s annual organizational meeting. Hugh Forsythe is sworn in as a new Leesburg Town Council member by Tara Belote of the Town Manager’s Office. In his presentation, Forsythe said “what you see is what you get” when it comes to him. A retired major general who spent 41 years in the U.S. Air Force, he continues to work as an operations controller for United Airlines. His career spans the commercial/civilian and military sectors in the aviation industry. He has also helped to plan the town’s annual Air Show. He is chairman of the board of directors of the Loudoun Volunteer Caregivers. Forsythe said he has been approached by several people in his Rotary Club, as well as members at his church, Cornerstone Chapel, to re-enter public service. He cited transportation solutions and finding a better balance between residential and commercial development as his priorities. 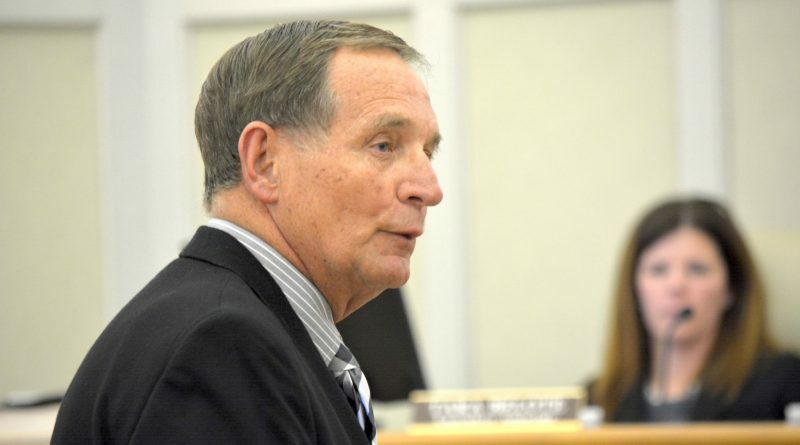 Forsythe initially did not receive the four votes necessary for appointment. Both he and the other four candidates were all put forward for appointment in separate votes, but all votes deadlocked on 3-3 votes. Thiel was put forward for consideration twice, but both votes deadlocked. The council ultimately voted to go into closed session to discuss the appointment. Both Councilmen Tom Dunn and Ken Reid voted against going into closed session. When the majority prevailed, Dunn said he would not participate in the closed session. Council members met in closed session for about 20 minutes. After emerging from closed session, Burk put forward another motion to appoint Forsythe and this time he was appointed unanimously. In an earlier vote in the evening, council members had voted to leave it up to whomever was appointed as to whether they wanted to begin their service immediately or wait until the next meeting in two weeks. 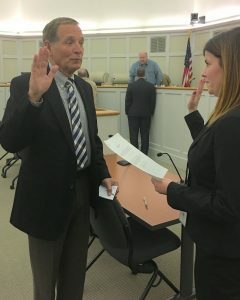 Forsythe chose to begin serving immediately and was sworn in by Tara Belote of the Town Manager’s Office. The council also voted hold the special election on Nov. 7, the same day as the General Election. That winner will fill the remainder of Burk’s council term, which expires Dec. 31, 2018. In an interview last week, Forsythe said he was unsure whether he would run in the special election. New Council, closed sessions, same old story. Let’s see Forsyth nominated by conservative Reid and voted for by other conservatives Fox and Dunn. Voting against Forsyth were the liberals Burk, Campbell and Martinez. Then Campbell calls for session for “open and honest discussion” and consider how they could get a swing vote. Wow, first Council meeting and Campbell can’t be open and honest in front of the public? And Campbell has to go into closed session to “consider” how everyone will vote for Forsyth so no one would look bad, or make some deal to be found out about in the near future? Two hours into his 4 year term and Campbell becomes the man of mystery. But hey at least we know he is honest behind closed doors. The way this unexpired term was filled is puzzling. We went through a very painful exercise similar to this last year (the role of mayor when Kristen Umstattd left to serve on the Loudoun Board of Supervisors). I urge the town manager and his staff to establish procedures for any future vacancies of this nature. If I were in charge I would have asked all those who ran in the town election in November if they would like to be considered for this vacancy and then vote for one of these people. After all they are the ones who stepped forward to serve the town, took the time to collect signatures , raise money for their campaigns and knocked on doors trying to get elected. It figures you want the selection to be from the democrats who ran and lost. And it figures you want bureaucrats coming up with the system for selecting public representation. Which btw is not allowed by state law. Elected officials picked a replacement and there will be a public election.